Wore Our Shoes to the Golden Globe Awards! 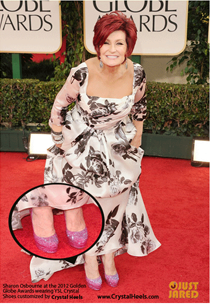 Sharon Osbourne wore our custom YSL pink crystal pumps to the Golden Globe Awards. Sharon also mentioned that these crystal shoes are one of her favorites in her collection! Camille Grammer loved our Louboutin Daffodile shoes customized with red Swarovski crystals and is pictured here with them at the debut of AMOREphosis jewelry at Stylehaus in Los Angeles.